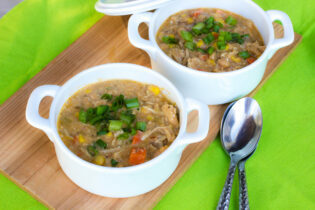 Made without cream, sour cream, butter or cheese, this creamy dairy free white chicken chili recipe is still every bit as rich and decadent as conventional versions. Nobody will ever guess the secret ingredient! In a large pot, heat the oil over medium heat. Add the onions, carrots and garlic and saute for about 5 to 6 minutes, until vegetables are soft. Add the chicken, green chiles, broth, beans, salt, cumin, oregano and paprika. Bring to a boil; reduce heat and simmer for 30 minutes. Stir in the “Clean Cuisine Dairy Free Sour Cream”, lime juice and corn. Serve warm and garnish with scallions.